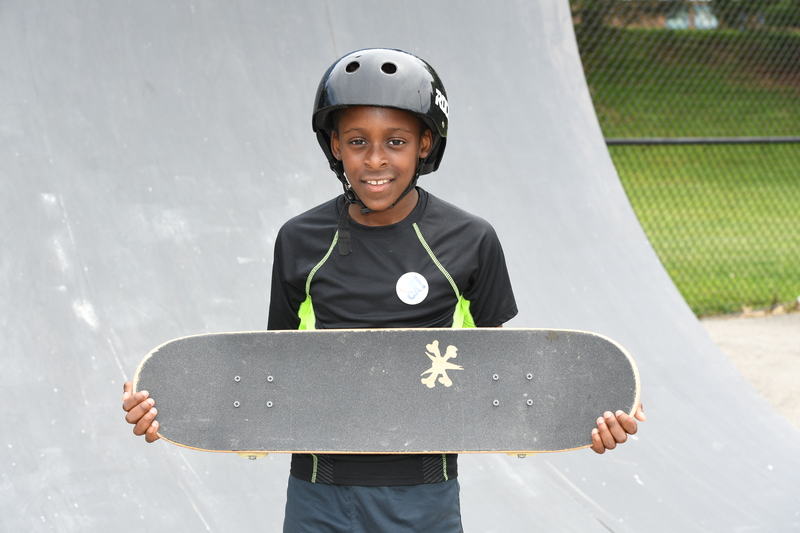 Skateboard Camp is a great way for skateboarders to improve their skills and progress at their own pace. Beginners will receive instruction on the fundamentals of skateboarding (balance, safety, pumping and turning and skate etiquette). Intermediate skateboarders will be taught techniques derived from both vert and street skate­boarding. Campers will have an opportunity to travel to other skate parks during the week to experience unique ramp elements. Campers can also enjoy other fun activities offered at CA’s SportsPark, including mini-golf and batting cages, and swimming at one of CA’s outdoor pools. Eight separate one-week sessions – Click here to see a sample camp schedule. Campers must wear closed-toed shoes, and it is suggested campers wear loose-fitting, comfortable clothing and socks. A hat and sunscreen are recommended. Campers should bring a healthy, nonperishable lunch and a refillable water bottle. Additionally, campers need skateboard, helmet, and elbow and knee pads. If you do not have the required safety equipment, it is available to rent from the SportsPark. Campers may also bring money to purchase items from the snack bar.